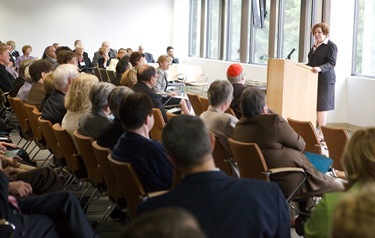 Last Wednesday, Mary Grassa O’Neill and I both addressed over 150 Catholic school principals and pastors at the Celebration of Education here at the Pastoral Center. Mary, who is our Secretary for Education and Superintendent of Schools, began her talk with an amusing anecdote, so I wanted to share it with you. 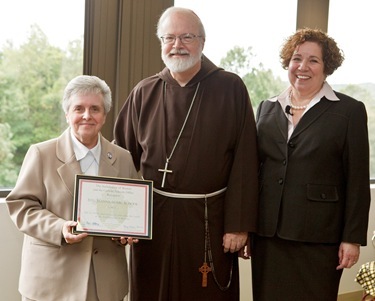 She told us many people presume that the head of the Catholic schools of the archdiocese must be a nun, so she’s often being called “Sister.” Some have joked with her that she needs to either wear shorter skirts, more makeup, or more jewelry. But, she said she decided maybe that she would get a tattoo, and then people would realize she was not a nun! 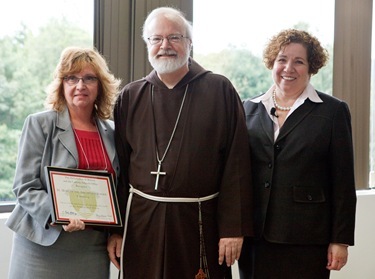 All humor aside, she gave a beautiful talk on the state of Catholic education in the archdiocese. 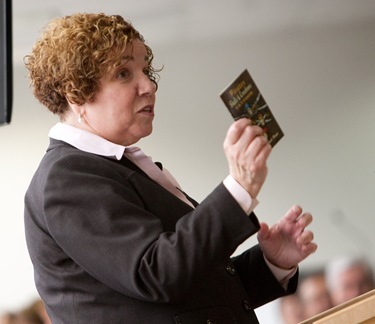 Her address called schools to work together and praised the wonderful job that’s being done in so many of our schools. She also spoke about the challenges that we are facing. Then I addressed the principals and pastors during a question and answer session. 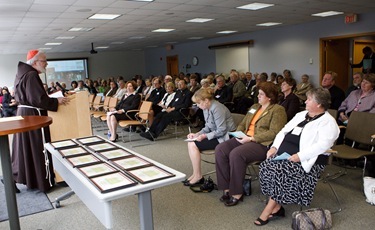 We also awarded certificates marking significant anniversaries of various schools. 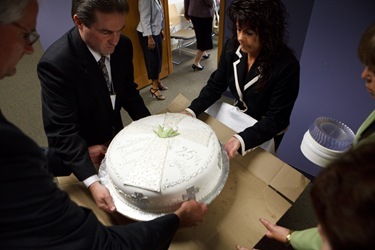 Right before the end of our meeting, the folks at the Catholic Schools office surprised me with a beautiful cake in honor of my jubilee. 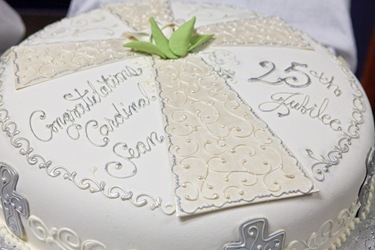 It was one of those cakes that are so beautiful, it seems a shame to eat it. But I think we managed pretty well, anyway! 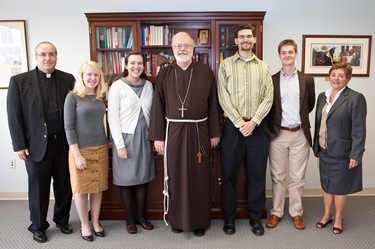 On Thursday, I met with FOCUS, a group of college campus ministers who are coming into the archdiocese. FOCUS is a movement of young people engaged in campus ministry. They do such things as peer ministry, setting up Bible groups and study groups. I understand they work in 45 universities around the country. 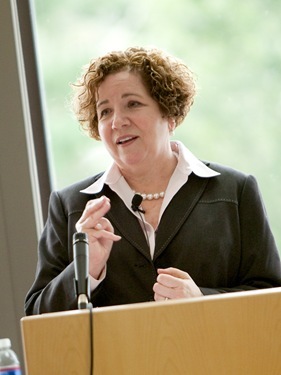 They have been extraordinarily successful in other places they’ve been and they are being their work here at MIT. 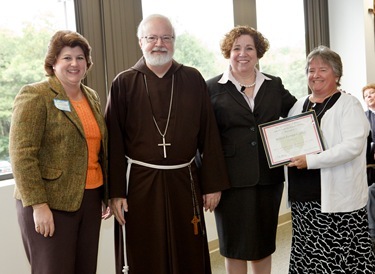 We are so pleased to have them in the archdiocese. Thursday was also the first Presbyteral Council meeting of the year with a new council. Msgr. Dennis Sheehan has been reappointed as the moderator. On Thursday night, I travelled to Rome for a few days. 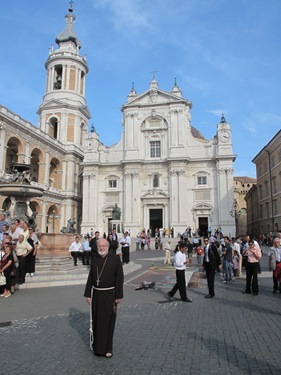 I was there primarily for meetings with the Congregation of the Bishops, and also to report on my visit to Cuba. 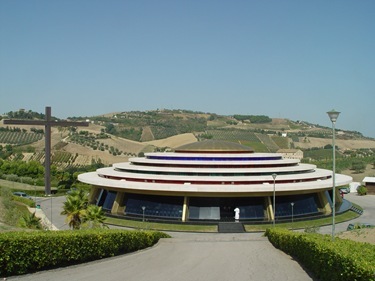 On Saturday, I was invited to attend the final days of a gathering of seminarians from the Neocatechumenal Way in Porto San Giorgio, on the Italian region of Le Marche. Porto San Giorgio is a tourist oriented town on the Adriatic coast, not too far from Rimini where, a few years ago, I attended another very important event for youth, “Il Meeting” which is organized every year by Communion and Liberation. 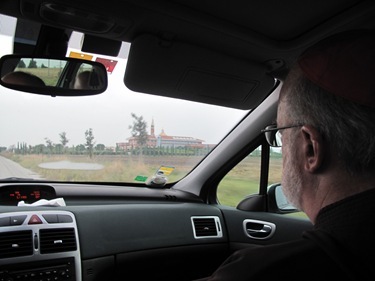 Father Antonio Medeiros, the rector of the Redemptoris Mater House of Formation in Boston, our Vocation Director Father Dan Hennessey, and Antonio Enrique, the editor of The Pilot, accompanied me during the trip. At this retreat, or “convivence” as they are called, prospective seminarians from Neocatechumenal communities from around the world gather and confirm their availability to enter one of the 76 Redemptoris Mater Seminaries around the world, including the one here in Boston. 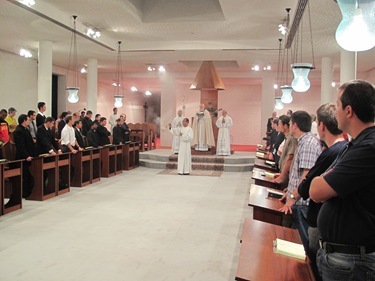 The men who enter Redemptoris Mater Seminaries receive a formation which is both diocesan and missionary. 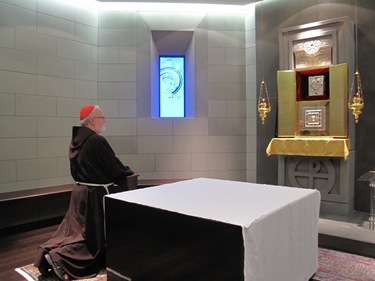 In many ways, it is not unlike the St. James Society, which was founded in Boston: diocesan priests who serve a time in the missions — some more, some less — but always remaining part of the diocese. 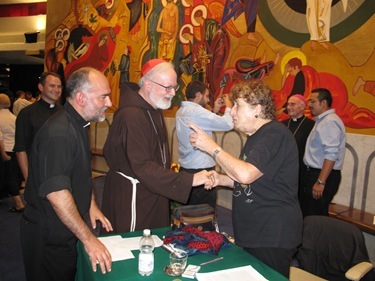 Kiko Argüello, Carmen Hernández and Father Mario Pezzi — who are the international team responsible for the Neocatechumenal Way — have always welcomed me very warmly. 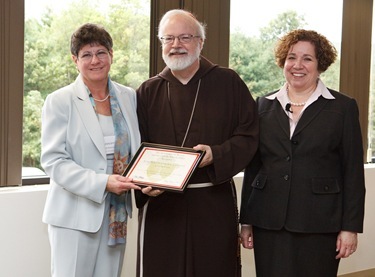 They were very supportive of my request to open a Redemptoris Mater House of Formation in Boston several years ago. To begin their missionary experience, the men entering the seminary are assigned, many of them at random, to seminaries spread over every continent. There, they will learn the local language, culture and one day, hopefully, be ordained as diocesan priests with a missionary spirit. 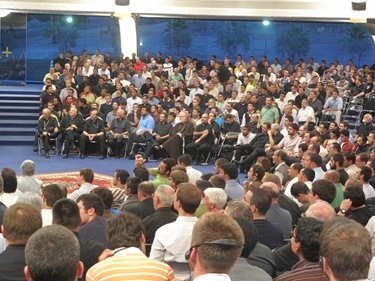 At the Saturday evening sending event, over 250 new seminarians were assigned to different seminaries. 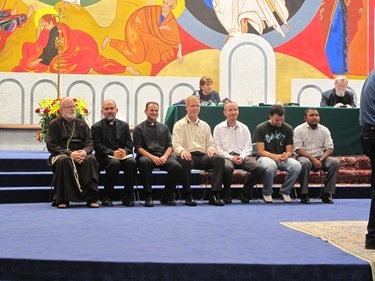 In addition to the new seminarians, there were also current seminarians from Europe and other places where the academic year has not begun yet. 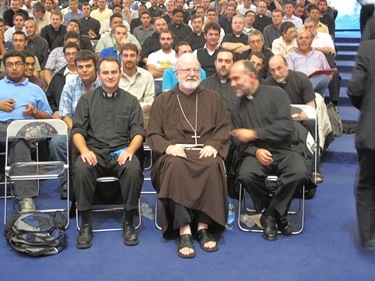 So, in all, over 1,000 seminarians and future seminarians attended — quite an impressive number. This is the second time I have participated in one of these gatherings. 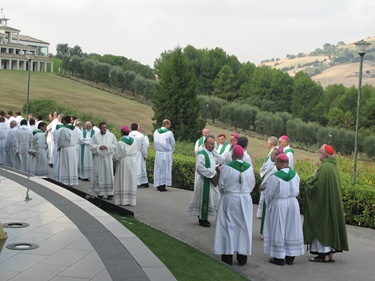 I was very impressed, as I always am, at the willingness of the young men to offer themselves to go anywhere in the world to be formed as diocesan priests. 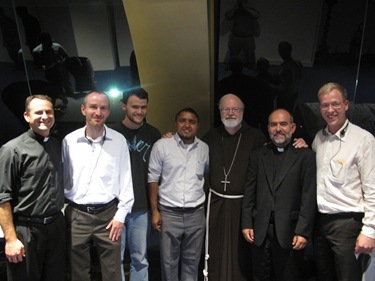 We received four new seminarians for Boston, two Polish, one Nicaraguan and one American. 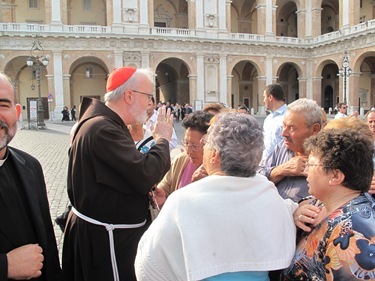 It reminds me very much of the spirit that was prevalent in the Church in the years when my own Capuchin community was sending so many people to Papua New Guinea and Puerto Rico. Every year, three, four, or five priests out of every class would be sent. 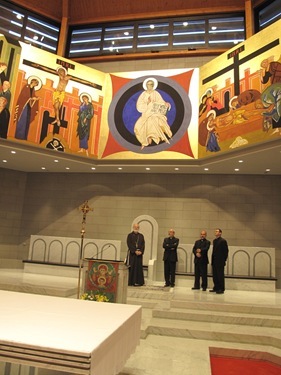 It is also impressive to see the countries where seminaries have been opened — including places like Scandinavia or Pakistan where the Church is embryonic at best. 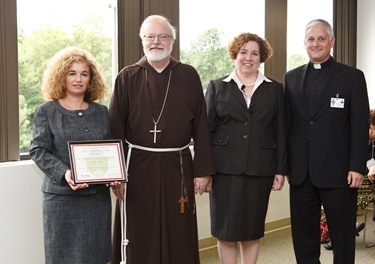 Pope John Paul II, as Bishop of Rome, opened the first Redemptoris Mater Seminary in his diocese in the 1980s. 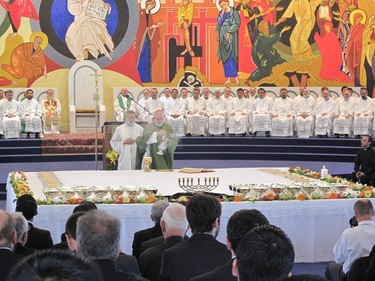 Soon, other bishops asked the Neocatechumenate to help them start seminaries in their own dioceses with that same missionary spirit. 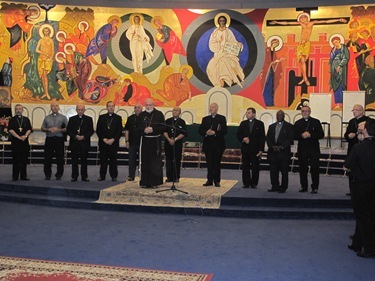 Currently, there are six here in the U.S.
A number of bishops and archbishops were in attendance including the Bishop of Curaçao, who is opening his own seminary. 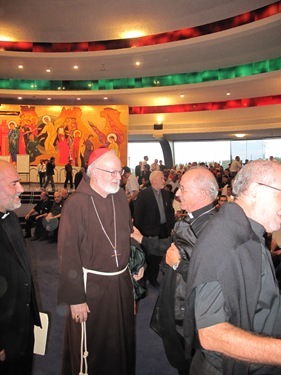 When I was in the Caribbean, I was part of the Antilles bishops’ conference there and we occasionally had meetings in Curaçao. 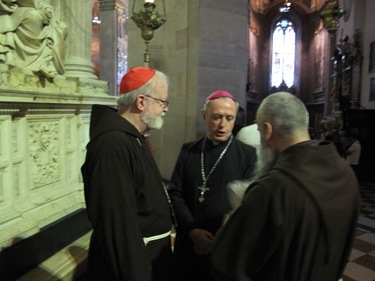 I know the Church there very well but, I had not yet met Bishop Luigi Secco, the new bishop who replaced Bishop Ellis a few years ago. 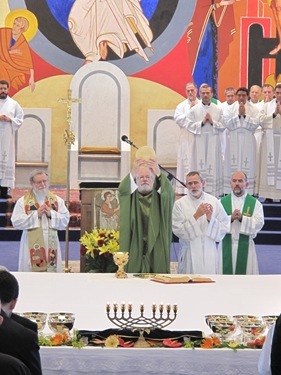 On Sunday, I presided at Mass for the group. 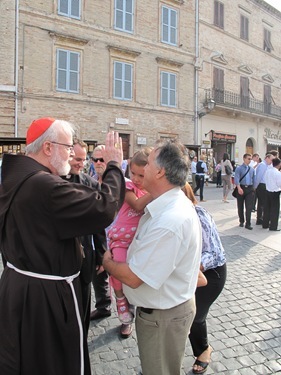 The singing in the Neocatechumenal communities is always very animated and the songs are always very scriptural. This year we ordained our first priest from that House of Formation, Father Israel Rodriguez, who is currently serving at Immaculate Conception Parish in Marlboro where there is a large Hispanic community. On Sunday afternoon, we visited the Basilica della Santa Casa in Loreto which is around 20 miles away from Porto San Giorgio. 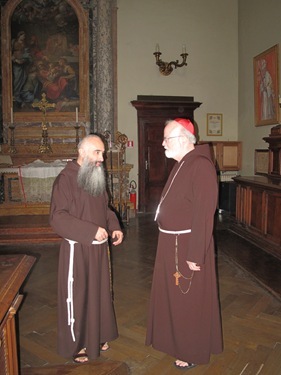 The care of the basilica is entrusted to the Capuchins. 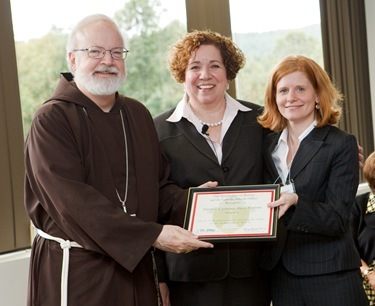 The friars were very welcoming to us. 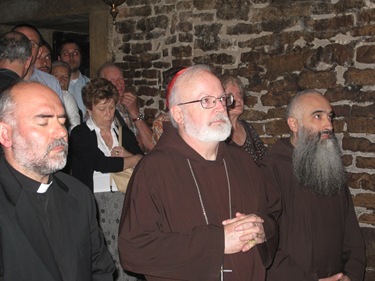 The friars there serve the pilgrims by welcoming them and offering them the sacraments, including the Sacrament of Reconciliation. They confess in many languages all day long and I could see the lines of those waiting to confess. 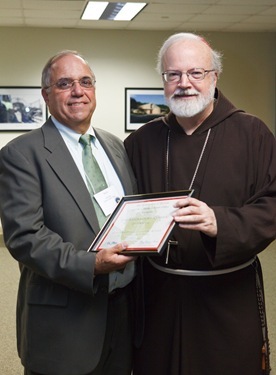 I was happily surprised to meet a Capuchin from the New York Province, who is originally from Medford. 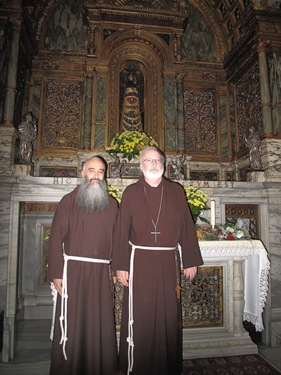 With the superior of the Capuchins we visited the House of Mary, a church within the Basilica that houses the original house where, according to the tradition, Mary was born and spent her early years and where the Angel Gabriel announced that she was to be the mother of Jesus. 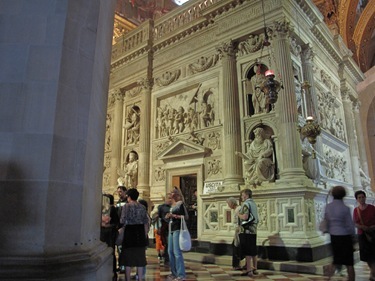 The outside of the Santa Casa is covered with art scenes of the life of Mary as well as scenes of other Old Testament women. They were very beautiful. 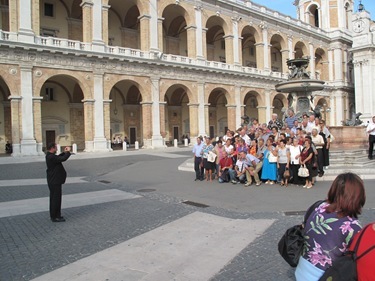 The local bishop of the Prelature of Lotero, Monsignor Giovanni Tonucci, greeted us at the Basilica and gave us a very detailed and very interesting tour of the place. 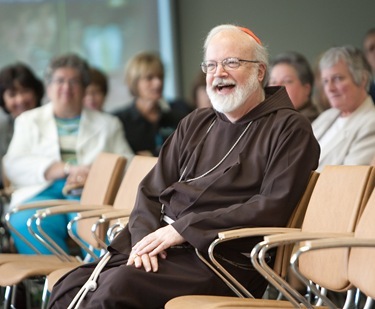 I had known him from when he was in Washington at the Nunciature as a priest in the 1980s. After visiting la Santa Casa we paid a visit to the Redemptoris Mater Seminary of Macerata, which is a few miles away from the basilica. 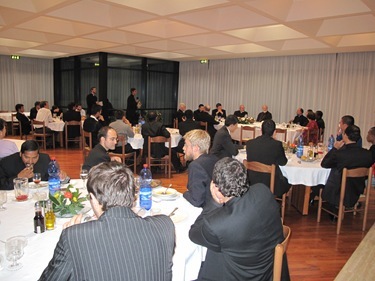 There we prayed vespers with the seminarians and had dinner with them. Macerata is the home town of Father Matteo Ricci, one of the great Jesuit missionaries to China. 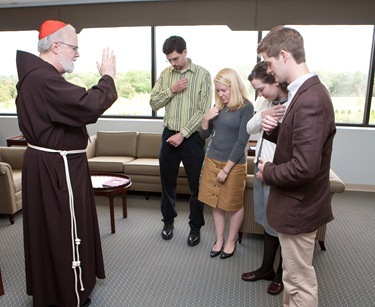 In fact, this seminary has a very special mission to prepare priests to work in China. In 20 years, they have ordained 50 priests, some of which are working in China. 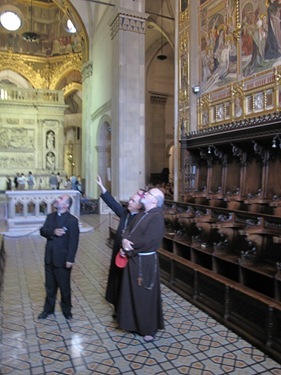 I was very impressed to hear that they have not lost any priests ordained from that seminary! 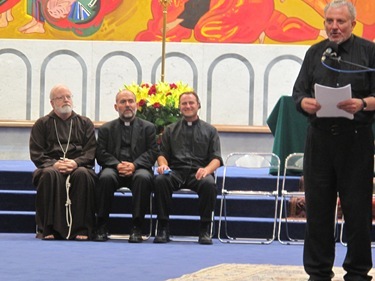 I´m a seminarist from Spain, from the new seminary of Burgos. 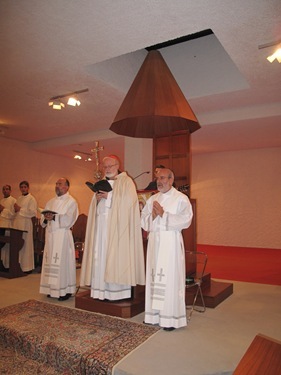 I was really enjoyed with your homily in the convivence of Porto San Giorgio last year. 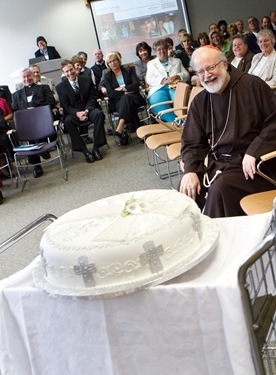 I´m looking for the homily in all places, but I haven´t it, so, could you send me the homily, please? Thank you so much!! Another favour, if it could be in Spanish, jeje. Thank you very very much. If hope to see you again this year. 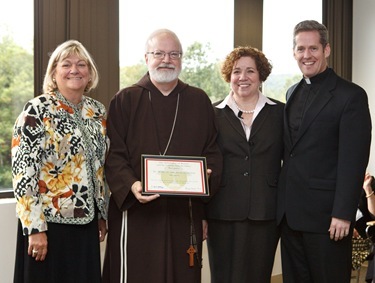 God bless you and your archdiocese!! We pray for you, we hope your prays. what a beautiful and ‘refreshing’ walk through this post of yours, Cardinal ~ thank you ~ times 10 ! I am walking in my community with 2 seminarians who said YES at the very Convivence you described here in Porto San Giorgio, last September. 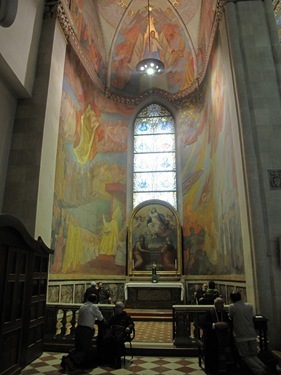 I have been privileged to attend Mass at the Redemptorist Mater Seminary here in Denver, Co. The fotos’ you posted are very similar to what we have here. Praise the Lord in this coming HOLY WEEK ~ and I am so amazingly blessed to be called into His Church + Happy Easter + and Peace! Dear Cardinal, Thank you for your grate experience, I from el salvador, but I´m part of the new carts! 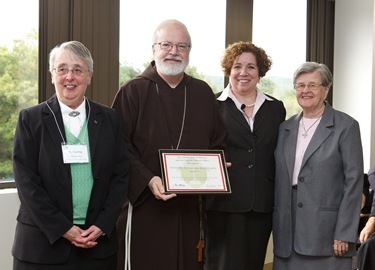 and i´m soo happy because the suport that you give to de seminary an seminarians too. I´ll praye to god, that he bless you in your mision. 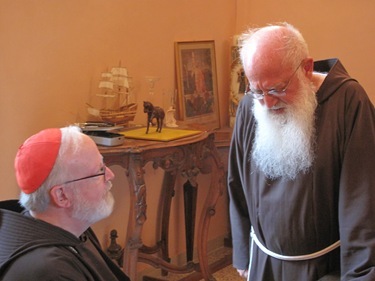 It really fills me with joy as a catholic to see a cardinal so disposed and open to new charisms in the Church, as the neocatechumenal way is one. 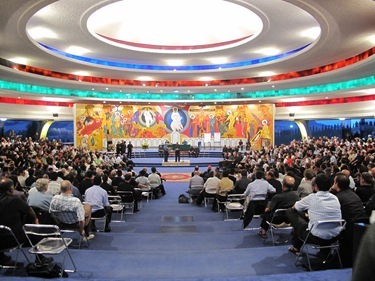 My expirience has been that a good number of priests are not even willing to listen to any information about the neocatechumenal way and its abundant fruits. Our parish priest has been with us since August of this year and has made up his mind in a negative way about the way. I would like to ask you for your prayers so that the Lord may help us all do his will. 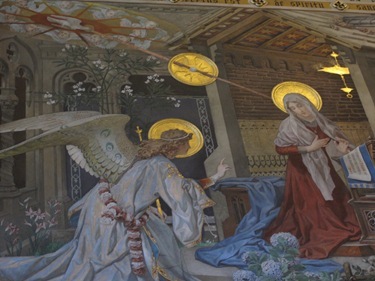 Please, always be open to the evangelization because thanks to this my marriage was saved and 3 more wonderful children of six were born and they all love God, the Church and are in community. May God bless you and help you in all your endevors. it was wonderful.am a neocatechumen from uganda still in the process of discerning my vocation.but thanks a lot for the blog. 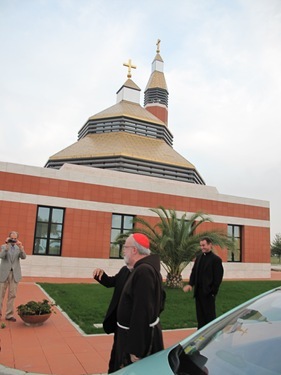 Now I ask him of any Heart Cardinal Sean’s to publish this beautiful Homily…. From Colombia a strong hug. Thank you Cardinal for the beautiful pictures and discussion of your time with the seminarians! I walk in the 2nd community of the Cathedral of the Immaculate Conception in Denver, CO. I am preparing for 2nd Scrutiny this coming weekend and am uplifted by your post. Christ’s peace be with you. I am a freshman at Boston College High School. I just wanted to take the time to thank you for sharing your experiences on your blog. 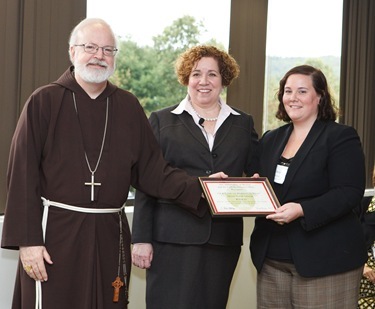 I am grateful to be receiving a Jesuit education at BC High, and I am thankful for the work you do for Catholic education. Thank you for you experience about these days. I hope that all these days help you to work to anounce the gospel.